Stax Records is so revered today that it's hard to believe it began in such modest surroundings: a two-car garage in Brunswick, Tennessee, a wide spot in the road, a project doomed to failure if it didn't relocate to a larger city. Jim Stewart moved his Satellite label 20 miles south to Memphis, setting up shop in a former movie theater; partnering with his sister, Estelle Axton, the company's name was changed to Stax in 1961 (a conflict with an already-existing Sateliite label necessitated the change). To call it a family business is a true, but obvious, understatement. Many musicians and musically inclined company employees, unrelated to the Stewart clan by blood, came on board in those first few years, extending the associable family through their devotion to the small business and desire to create some fresh grooves. 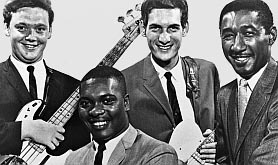 Guitarist Steve Cropper and bassist Lewie Steinberg, key players in the the company's milestone hit, "Last Night" by The Mar-Keys, were part of that extended family. Drummer Al Jackson, Jr. and keyboard player Booker T. Jones, who at one point were in Willie Mitchell's hot Memphis band, came along later and fit right in with the tight-knit crew. Jackson's father, a longtime Memphis bandleader, provided Al with his first chance to perform in public, playing drums with his band at age ten. Cropper's family moved to Memphis when he was nine. By the end of his teens he had gotten in the door at Stax, eventually becoming one of Stewart's most trusted employees, overseeing recording sessions and playing guitar on many dates in addition to doing promotion work, traveling to radio stations within a few hundred miles of Memphis. Steinberg had quite the musical family: his father, Milton Steinberg, was a well-known local nightclub pianist. Sister Nan was a singer in the '30s, most notably with Fats Waller's band. Brothers Luther (trumpet) and Morris (saxophone) had played for Lionel Hampton; Morris had also worked with B.B. King and been a member of Rufus Thomas's band The Bearcats. Diane played piano and composed songs; Wilbur worked at Stax. In 1954 Lewie's niece, Martha Jean Steinberg, became an on-air personality at WDIA, the trailblazing station famous as the first in America to be formatted exclusively for black listeners; she was nicknamed "The Queen" and had a successful radio career in Memphis and Detroit right up until her death in 2000. As for Lewie, he gained valuable experience working sessions at Hi (another Memphis label) and as a member of Mitchell's band with Jackson and Jones. In his youth, Booker T. practiced on a variety of different instruments (ukulele, clarinet, bass, oboe, saxophone, trombone), finally settling on the piano as his favorite. In church he took his playing to another level as an organist. In the early '60s the teenaged Booker played bass with a band headed by Gene (Bowlegs) Miller, a regular fixture in a number of Memphis nightclubs. While still in high school he formed his own Booker T. Washington Combo (named after the school) with two already-graduated friends, pianist David Porter (later a super-songwriting Stax-man) and Maurice White (still later the founder and frontman of Earth, Wind and Fire). Before graduating he began sitting in during evening recording sessions at Stax. Jim Stewart was impressed with the teenager's mature, positive attitude and decided to keep him around. For a one-off session with rocker Billy Lee Riley (who'd made some killer discs for crosstown label Sun), Stewart booked Booker T., Steve, Lewie and Al; the guys hit it off and an after-hours jam session resulted in the as-yet untitled "Green Onions," based on a riff Jones and Jackson had played at the Flamingo Room (near Beale Street) during their time with Mitchell's band. Later, after the finished track was made release-ready, Cropper took an acetate of the song to Reuben Washington, a popular morning show personality at WLOK; Reuben played it, the phones lit up, and people weren't calling to complain! 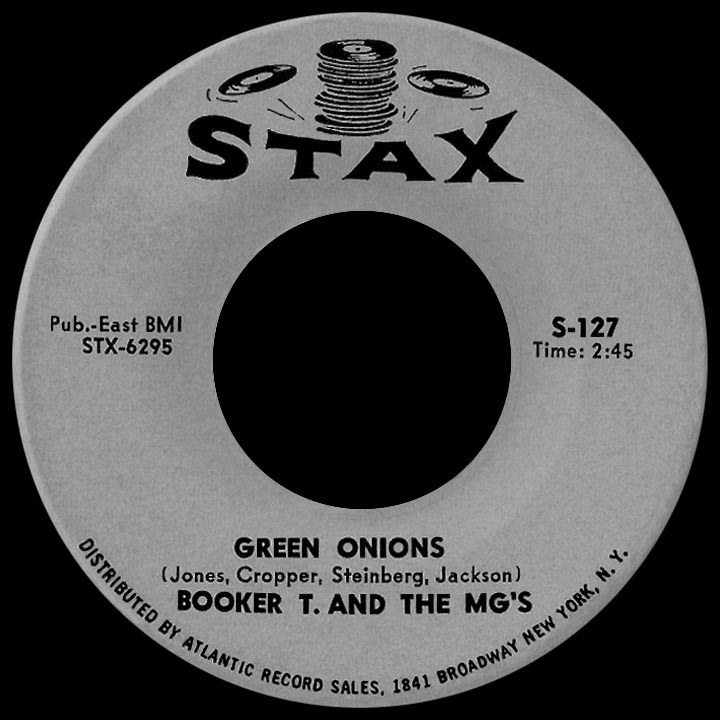 The Satellite Record Shop (run by Estelle Axton at the front of the Stax studio) started getting calls asking about the song; the group considered calling it "Onions," but that seemed a bit negative (read: stinky!). Cropper later suggested "Green Onions." The four-man band also needed a name and took a cue from another food song, "Burnt Biscuits," an instrumental Stax single by The Triumphs. The car name appealed to them, so MG's was agreed upon, but the company's lawyers found Morris Garage (makers of the MG automobile) took offense to them using it, so the guys came up with an alternate explanation, insisting it stood for "Memphis Group." Jones's name went up front and the band permanently became known as Booker T. and the MG's. 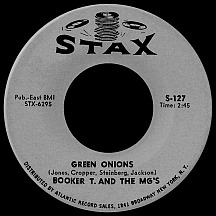 "Green Onions," distributed regionally on the Volt subsidiary, was switched to Stax for national release and caught on quickly; people connected to the cool, dangerous-sounding groove, which hit the top ten on the pop charts and number one rhythm and blues in September 1962. The follow-up singles were jam-session variations on the "Green Onions" sound. "Jellybread" and "Chinese Checkers" had mild but respectable chart success in 1963. "Mo-Onions," a blatant sequel to the big hit, didn't quite catch on, yet every track is musically creative and hard to resist, regardless of whether it was played heavily on stations at the time or discovered by fans somewhere down the line. The MG's continued (with the Mar-Keys) as a Stax house band, playing on many artists' hits. "Tic-Tac-Toe" and "Soul Dressing" added to the group's run of soulful instros. By 1965, Lewie Steinberg had become increasingly unreliable and difficult to work with. Cropper convinced Jones and Jackson to bring in a replacement; former Mar-Key Donald "Duck" Dunn grew up on the same street as Steve and the two had recorded with The Van-Dells (a short-lived band with one Stax single, "The Honeydripper"); he jumped at the chance to be an MG. Dunn's first outing, "Boot-Leg," was made without Booker T., ending up as a project with Isaac Hayes on keyboards and various members of the the MG's and Mar-Keys. Dunn wasn't involved with what turned out to be a trick pulled on the band by popular Los Angeles deejay Magnificent Montague. In August 1965, while performing in L.A. with several of the company's acts on the Stax Revue tour, Montague hired Booker, Steve, Al and Packy Axton of the Mar-Keys for a date that resulted in an impromptu recording, released without the band's knowledge, as "Hole in the Wall" by The Packers, a fair-sized hit at the end of the year (the three MG's did, at least, receive songwriting credit for the track). 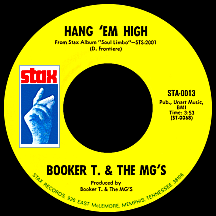 Stax continued putting out 45s by Booker T. and the MG's including "My Sweet Potato" and "Booker-Loo," a strong coupling in the fall of '66, and the group's first seasonal effort, "Jingle Bells," an airplay favorite for many Christmases afterward. Having studied music extensively at Indiana University, Jones felt his songwriting had matured, evidenced by the spring '67 hit "Hip Hug-Her" (its title inspired by the lower-cut hip-hugging girls' jeans in style at the time), the group's first top 40 hit since "Green Onions." It was followed that fall by the jazzier "Slim Jenkin's Place," which radio programmers flipped in favor of an instrumental cover of The Young Rascals' "Groovin'," another top 40 hit for the MG's. Stax was about to go through a major change. Al Bell, who'd joined the company in 1965 as promotion director, had, in just two years, risen to a position as vice president and part owner. He actively pursued the label's independence from Atlantic Records, which had distributed Stax-Volt product since the beginning through an outdated agreement Bell felt impeded the growth of the label. In 1968 a deal was struck with Gulf and Western (a conglomerate buying up many companies considered hot properties), a difficult transition for the still relatively small operation. By the summer of '68, even the most casual fan could see that something was different; the records appeared with yellow labels (replacing the light blue that had been the standard for several years) sporting a new "finger-snapping" logo. 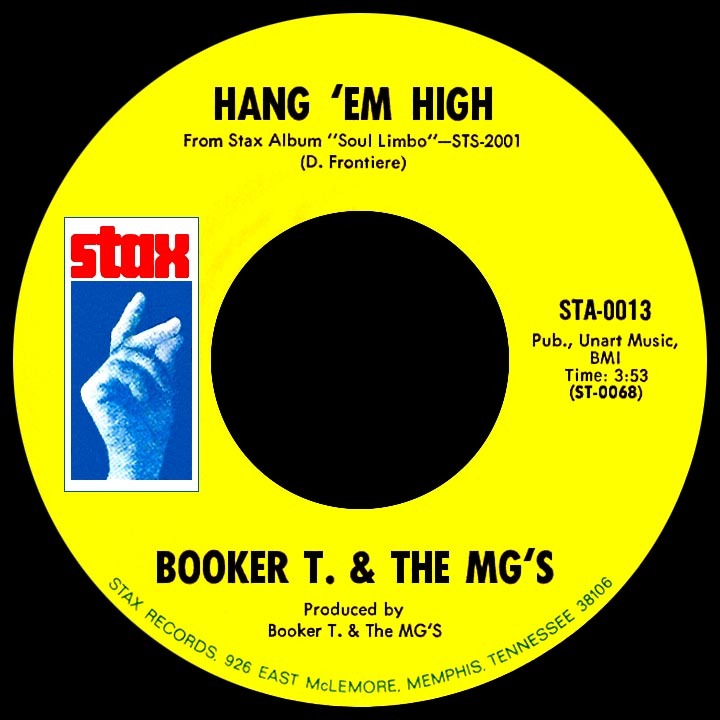 "Soul-Limbo" by Booker T. and the MG's was the first single on the new label; a departure for the group, it featured a cowbell, steel drums played by Jackson, Isaac Hayes on piano behind Booker's organ and a marimba break by Terry Manning (formerly affiliated with The Bobby Fuller Four in El Paso, later hired as a studio engineer for Ardent Studios, he ultimately made his way to Stax). Right off the bat the reconfigured company had a hit. The theme from "Hang 'Em High," a Hollywood-produced western film starring Clint Eastwood, was released as the next single in the wake of the success a few months earlier of "The Good, the Bad and the Ugly" by Hugo Montenegro (from director Sergio Leone's Italian-made "Spaghetti Western," also starring Eastwood). It was much different from the original version, written and performed by Dominic Frontiere in the film, though the composer was impressed by the Memphis Group's reworking of the material. With competiton from a version by Montenegro, the single took some time to connect, but steadily climbed the charts and hit the top ten in February 1969. Realizing a goal he'd had for some time, Booker T. composed his first movie soundtrack (made possible through the label's association with Gulf and Western, also owner of Paramount Pictures since 1966). Up Tight, directed by Jules Dassin (who'd built an impressive resumé in Hollywood), was conceived as a modern remake of John Ford's Oscar-winning 1935 film The Informer, addressing the black militant movement in a way no one had previously dared; the MG's played on the soundtrack and Booker T. sang on one track, "Johnny, I Love You," released on the flip side of the next single, "Time is Tight," also from the film (it was changed from "Up Tight" to avoid confusion with Stevie Wonder's hit of the same title). Based on a rhythm similar to Otis Redding's 1965 R&B hit "I Can't Turn You Loose," the hard-to-resist, slowly-erupting track went top ten in April '69, the second biggest of all MG's hits. Booker T. unofficially left Stax at the end of 1969, dissatisfied with Bell's handling of the company but mainly disillusioned by the impersonal, corporate way Gulf and Western treated the artists, particularly the ones who, like Steve, Al, Duck and himself, had been there for many years. He moved to Los Angeles but continued to record with the MG's, in New York and other locations, for another year or so. McLemore Avenue came out of sessions in Memphis and Los Angeles; the album, an instrumental version of The Beatles' Abbey Road (omitting a few of the 17 songs and taking certain liberties with track order), even had a "walking-across-the-street" cover (taken right in front of "Soulsville U.S.A."'s theater-turned-studio headquarters) as a parody of the Beatles cover. As with the Beatles original, George Harrison's "Something" was the single. The group broke up in 1970 after recording "Melting Pot," their jazziest number yet, and a few other tracks, at a New York City studio. The three remaining members ventured on with "Jamaica This Morning" in late '71. Steve left Stax for reasons similar to the ones that had driven Booker away. Al and Duck put a new MG's group together with keyboard player Carson Whitsett and guitarist Bobby Manuel, an album and two singles resulting; "Sugarcane" hit the R&B charts in the summer of 1973. Eventually Jones, Cropper, Dunn and Jackson, the hitmaking '60s lineup of MG's, decided to get together again. In 1975 they made plans to begin working on a new album just after the new year, but something happened almost immediately that knocked the wind out of their sails. Marital problems between Al Jackson and his wife, singer-songwriter Barbara Griffin, had escalated beyond reason; at one point she shot him in the chest, wounding but not killing him. Just after midnight on October 1, 1975, Al returned to his Memphis home after attending a closed-circuit theater broadcast of the Muhamad Ali-Joe Frazier heavyweight boxing match (the famous "Thrilla in Manila"). This time he was shot and killed. His wife claimed intruders had broken into their home and committed the murder, but the case has never been solved and was considered still open for many years. Jackson's death derailed the group's plans to reunite. 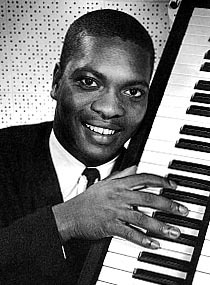 Booker T. Jones, Steve Cropper and "Duck" Dunn finally recorded an album for Asylum in 1977; Jones has since made solo recordings and the band has reunited for concert tours throughout the years. I've had the pleasure of seeing Booker T. and the MG's perform on a few occasions, meeting the legendary trio (and latter-day drummer Steve Jordan) in 1994 at a release party in San Francisco for what turned out be their final album together. Watching these guys launch into their classic Stax trax up close, I can tell you they laid down a Major Groove, giving everyone in attendance Maximum Goosebumps. I found myself feeling Maniacally Giddy and, ultimately, Mucho Gratified. Had enough corny phrases? Well, this Magnificently Great instrumental combo can be simply and accurately described as the quintessential Memphis Group.